Snowmen, sleds, and sliding on frozen puddles—young booklovers can experience the most exciting parts of winter fun in Elizabeth Spurr’s In the Snow, the second in a board book series devoted to discovering weather. 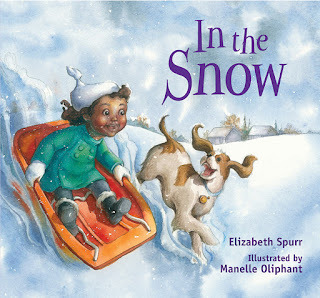 In a similar style to In the Wind, the first book in the series, Spurr’s simple rhyme is coupled with Manelle Oliphant’s delightful illustrations that depict a young girl of color with her mom and pet dog having fun on a snowy day. The charming protagonist’s chilly adventures will introduce your earliest readers to the beauty and wonder of freshly fallen snow and the activities they can experience in the coldest parts of winter. Perfect to use as a read aloud, this board book will help introduce the youngest readers to one of the most magical seasons of the year, whether or not they get to experience snow for themselves. Look for In the Snow at your local library, indie bookstore, or Barnes & Noble on October 1! Check out the rest of our Fall 2017 list, both new titles and new paperbacks!